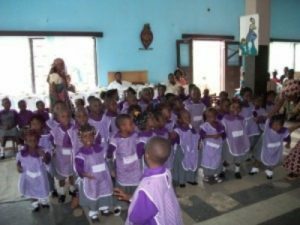 Cecil and Joan Memorial Bilingual Nursery and Primary School abbreviated C&J: Mebinaps was founded by Mr Niger Thomas Moses a seasoned educationist and a pedagogic Inspector and Dr/Mrs Margaret Niger Thomas, a social Anthropologist and lecturer at the University of Buea, Cameroon. In its inception in September 2008, C&J registered 15 pupils (boys/girls) housed in its imaginatively converted Hotel facility to a resource centre. The population has increased to 50 pupils in its second year 2009 ranging from nursery 1pupil to Primary 4. With this rate of increase, it is hoped that by its 3rd anniversary C&J would have recorded over 100 pupils. 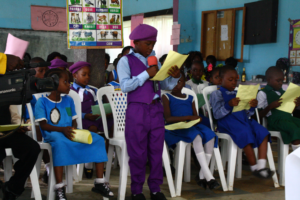 C&J Mebinaps is child centered and ensures that each class does not exceed 25 pupils unlike government runned schools that have very large teacher – pupil ratio. C&J has adpoted the Montesori /Approach to education which is a child – centered method by which children are trained to be creative, explorative, communicative and innovative, while the teacher remains the guide. C&J Mebinaps distinguishes itself by providing food for its pupils as the administration realized that most pupils come to school without eating, thus in order to learn effectively, children need to have energy. Apart from a radically different approach, C&J Mebinaps also offers innovative additional programs to facilitate its pupils in learning and personal development. Amongst these are the availability of the kiddies corner, Holiday program, “one book a week” library project, school bus system, special days inclusive are celebration of the Human Rights day, Environmental Day, Sports Competition, Christmas Jamboree, Nursery and Primary Graduation and the C&J Mebinaps Parents Teachers NetWork. With the school’s yearly growth and limits imposed by the lack of funds, C&J Mebinaps desperately needs better facilities. For more information on the new projects and how you can help see the AMEF HELP Page; “bag pack gesture”, scholarship. Given the fact that C&J Mebinaps lays emphasis on the need for pupils in class three upward, to be able to read and write, the adminisatration has adopted a special “one book a week” program where pupils can sign out books from the library, read it at home and on Fridays being the last day of school week, share what they read with their friends at the Kiddies Corner. As a way of encouraging a holistic development of children C&J sets aside annual days for sports, music and arts. An inter-class competition is intended once a month with various sporting activities inclusive, filling the basket, dressing race and many other outdoor games. A Human Right’s Day is celebrated every ———-, music and arts day (Open Day) is held annually in December alongside the Christmas Jamboree. C&J lays special emphasis on the celebration of World’s Environment Day — where by pupils are given little palm/trees to plant and nurse, thus making them abreast with nature and combating climate change which is the order of the day; see slights of Christmas Jamboree. Gradation day for C&J Mebinaps is held in June each year and it involves performance by the pupils in drama, music, and dance, rhymes, debate and culture parade. 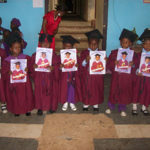 The nursery 2 pupils receive a diploma as they graduate to class 1. The administration awards prizes to the best pupils and the founder of C and J makes a “bag-pack gesture this consist of a new school bag, books, pens and pencils to the poorer pupils in view of the new school year as well as scholarships to some very desperate cases and very brilliant pupils. Criteria to determine scholarship program see the AMEF HELP program. 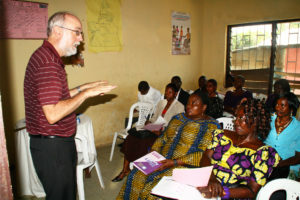 In other to include the parents in the holistic growth and development of their children, C and J instituted the C and J Parents Teachers Network where by the parents are encouraged to watch and follow the performance of their children, and in their annual meetings make suggestions to the school administration. However, there is also a suggestion box for criticisms and new ideas, always welcomed by the administration. C&J Mebinaps has made provisions for a sick bay in case kids/pupils turn ill. In case of very serious cases, the services of a Philanthropic Health Service Reaching out to the poor, needy and the Homeless: RUPHCAF, is contacted. This health unit is quite close to C&J Mebinaps and is well recognized.